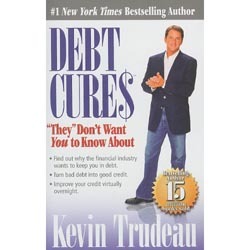 Debt Cures by Kevin Trudeau is a back to basics guide to been debt free. This book is not for everyone, however this is great for people who are wanting to start there path into debt free. It contains some basic strategies and ideas to get you on your way. You can by his book Debt Cures on Amazon. With your help we can reach more people and let them know about Debt Cures whether this product works or not.